I was starting to get nervous. 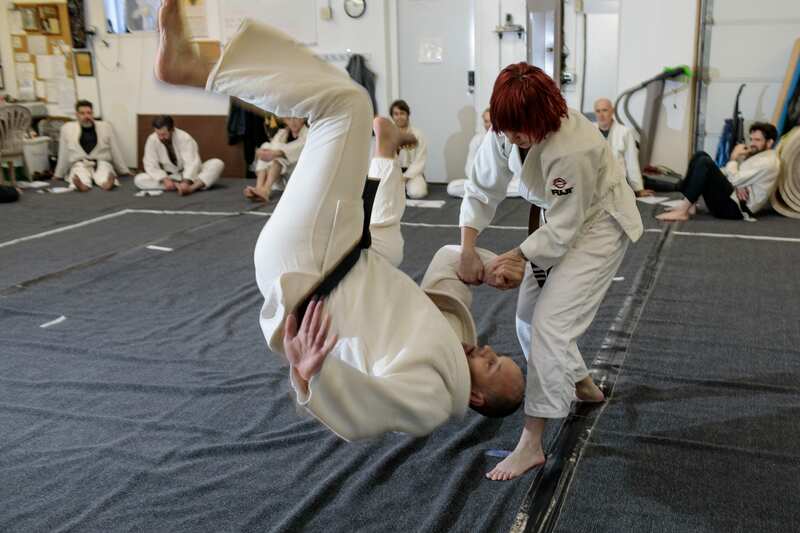 Because our dojo had moved, I hadn’t practiced jujutsu in a month, and here I was participating in a competition! The competition was for brown belts and black belts, but mostly black belts participated. 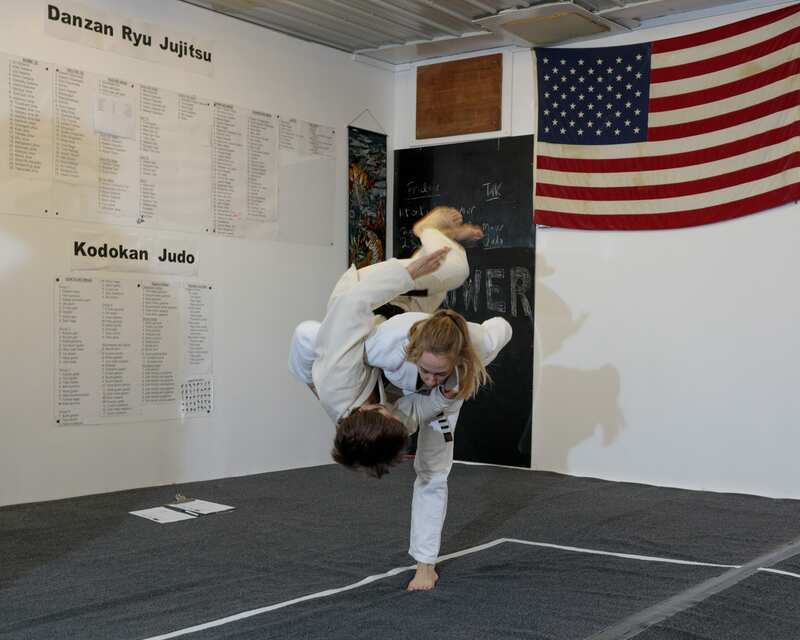 Sensei Ward Melenich and Sohn Wehseler were hosting the competition in Duluth, so most of the contestants were from their dojo, Kuroinukan. Four participants from Shinzen Kai dojo in St Paul, including myself, made the drive. Sensei Dan Browning also drove up to photograph the contest and judge. I was told it would be a relaxed atmosphere, and, sure enough, the day started by sitting in the lounge area and chatting until everyone arrived. Then we put on our gis and started stretching. 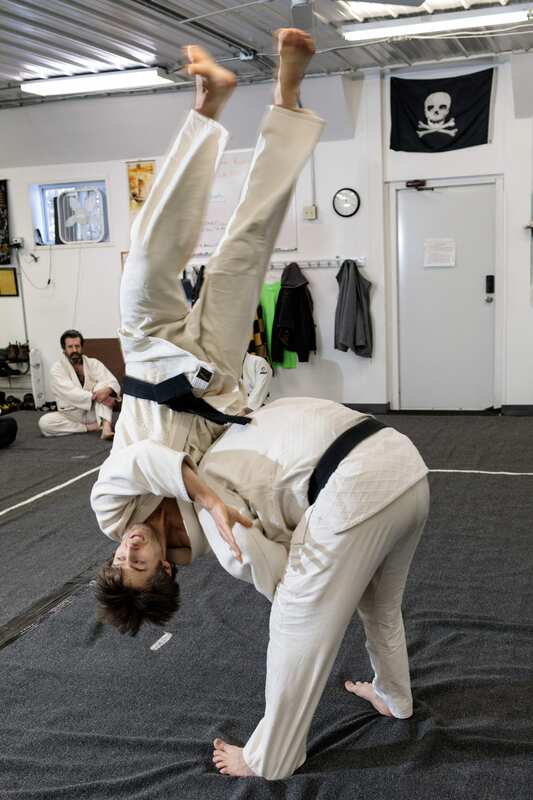 I hadn’t competed in a jujutsu contest before, but I was told there would be two categories: “kata” and “freestyle.” After the contest, there would be a class for brown belts to work on problem techniques. First was the kata contest. We partnered up and started practicing. 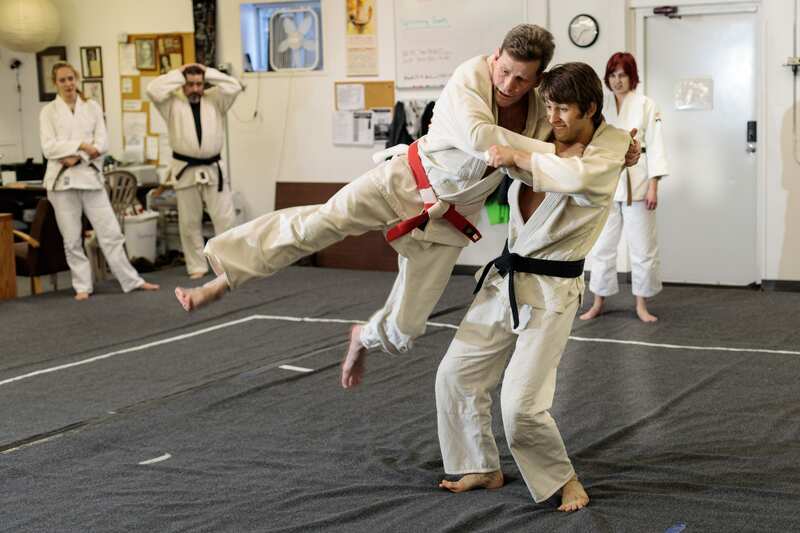 I was partnered with Sensei Jason Davis, who explained the procedure to me. Each pair was given a list of five techniques based on the level of the lowest-ranking partner. We split up the techniques, choosing which person would perform which technique. After that, we chose three elective techniques from any list appropriate to our rank. Then together we came up with a combative sequence that combined some of the required techniques and some of the elective techniques. I was surprised to find that I had so much fun helping to come up with the sequence, and my nervousness dissipated. After practicing, we performed for the group and the camera, and did our individual techniques and combative sequence. Melenich and Browning were the judges. The atmosphere was as formal as a test, but the combative sequences were outrageous and funny, and some choreographed trash talk was added in for flavor. We all laughed and smiled and had fun. Everyone was supportive, complementing and encouraging one another. It was clear that the purpose of the competition wasn’t to win anything, but to maintain our best quality under pressure, have fun, and learn. The kata gave us the opportunity to do quality technique in front of a group. The electives gave us a little bit of opportunity to show off. And the combative sequence gave us practice being creative and transitioning between techniques. After the kata contest, we competed in freestyle. There were three rounds. In the first, one person was continuously attacked by another for a set amount of time, giving them the opportunity to do various techniques from a variety of attacks. In the second round, the person had a different attacker. In the third round, both attackers would alternate, attacking from different positions. We were judged on safety, variety and control, and overall effectiveness. When it was my turn, I quickly discovered that the true challenges of this test was endurance and remaining calm. In the first round I was able to think quickly and respond, but the adrenaline and exhaustion soon took its toll and my ability to think quickly and execute the techniques deteriorated. This gave me a few insights as to how I can improve. To control myself under the influence of adrenaline, I need to be mindful of my breathing. I need to understand the difference between reacting and planning, and respond with either as appropriate. I also need to understand that the gift of adrenaline is in speed and power at the expense of precision, and therefore be able to cultivate precision even under those circumstances. It also gave me insight into some elements of a self-defense situation. There was a level of unpredictability and reactiveness that is valuable to cultivate in one’s overall practice. Even though I could see a lot of room for improvement in my performance, I got nothing but compliments afterward. I felt accomplished and encouraged. The camaraderie and insights continued through the brown belt class afterward, as we helped each other to improve. All Photo Credits: Dan Browning.